Pick Analysis: Allen won the 2016 Chuck Bednarik and Bronco Nagurski Award as the nation's top defender on the nation's top defense in 2016 (69 tackles, 16 TFL, led team with 10.5 sacks). He repeated as first-team All-SEC following an excellent junior year where he finished second in the SEC with 12 sacks (14.5 TFL, 4 PBU). The 2012 Virginia Gatorade High School Player of the Year contributed early in his first year, playing regularly as a freshman reserve (16 tackles, three TFL) and then stepped into the starting lineup as a sophomore (11.5 TFL, 5.5 sacks). Published: April 27, 2017 at 10:26 p.m. The Washington Redskins select Alabama defensive end Jonathan Allen No. 17 in the 2017 NFL Draft. Published: April 27, 2017 at 10:29 p.m.
NFL Media's Matt Smith, Bucky Brooks, and Lance Zierlein gives Jonathan Allen a B draft grade. Published: April 28, 2017 at 01:17 a.m.
NFL Media's Dave Dameshek and Ike Taylor talk to Jonathan Allen after he is drafted by the Washington Redskins. Published: April 26, 2017 at 11:41 a.m.
Join Jonathan Allen on his draft week journey as he enjoys his last day in Tuscaloosa, AL with his fiance Hannah and a final trip on campus before traveling to Philadelphia for the NFL draft. Published: April 18, 2017 at 01:02 p.m. Which superhero was Jonathan Allen named after in high school? Here are five things you should know about the Alabama defensive lineman. Published: April 12, 2017 at 06:38 p.m.
Everything you need to know about Alabama defensive end Jonathan Allen. Published: April 5, 2017 at 07:09 p.m.
On the surface, Alabama's Jonathan Allen has enjoyed a charmed college career: SEC Defensive Player of the Year, All-SEC First Team, a national championship. But the defensive end?s distinguished resume obscures a deeper intensity and a fire he?s channeled toward potential first round draft status. 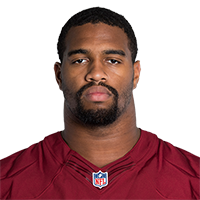 Published: March 5, 2017 at 10:57 a.m.
NFL Now Live analysts describe potential NFL landing spots for Alabama DE Jonathan Allen. Published: March 5, 2017 at 11:34 a.m.
Alabama defensive end Jonathan Allen's 2017 NFL Scouting Combine workout. Published: March 5, 2017 at 10:55 a.m.
Ike Taylor and Maurice Jones-Drew describe Jonathan Allen using a term from their scouting glossary. Published: March 5, 2017 at 01:20 p.m.
Alabama defensive lineman Jonathan Allen chats about his combine experience, which players he compares himself to and why Alabama is always competing for titles.